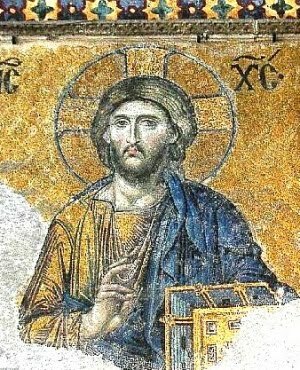 The most famous of the surviving Byzantine mosaics of the Church of the Holy Wisdom (Hagia Sofia) in Istanbul (formerly Constantinople) - the image of Christ on the walls of the upper southern gallery. Christ is flanked by the Virgin Mary and John the Baptist. The mosaics were made in the 12th century. Byzantine art and the icon seem almost synonymous after more than six weeks of study and discussion of this topic. I just completed a summer class at the Newberry Library on this and found that both the history and the art of Byzantium intrigued and invigorated me. Throughout the course there was a focus on icons which were most often based on stories from the life of Jesus. These church images started as early as the catacombs of Rome but flourished during the rise of the Eastern Roman Empire founded by Constantine and continued after the fall of Rome and the west as what we know as the Byzantine Empire for almost one thousand years until it too succumbed to invaders in 1453 AD. Constantine's conversion and the subsequent declaration of Christianity as the official religion of the empire was an important factor in the influence of the sacred in Byzantine art. Other influences on Byzantine art icons included Egyptian mummy portraits. One of the best sources for viewing the influence of Byzantine art is in the sacred mosaics of Ravenna Italy. They are the finest outside Istanbul. A thriving seaport in ancient times (it now lies five miles inland), Ravenna rose to power in the 1st century BC under the Emperor Augustus. The Roman emperor built a port and naval base at nearby Classe, which is currently undergoing archaeological excavation. The town converted to Christianity very early, in the 2nd century AD. As Rome's power declined, Ravenna took over as capital of the Western Empire (402 AD). The following century it came under the rule of Thedoric and the Arian Ostrogoths, and in 540 the city became part of the Byzantine empire under Justinian. Ravenna's exquisite early Christian mosaics span the years of Roman, Ostrogothic and Byzantine rule. Today, Ravenna is a very pleasant town of about 140,000. It looks much like any other Italian city at first glance, with old streets, fine shops and peaceful squares, but the Byzantine domes of its churches still evoke its Eastern heritage. Ravenna's early Christian churches and mosaics have been collectively designated a World Heritage Site. With the fall of Constantinople and the Byzantine Empire to the Ottoman Turks in 1453 some of the artists fled to Crete and established a Greek artist colony. Notable artists included Michael Damaskenos (1530/35-1592/93) and others of the "Cretan School", but the most famous today is the artist simply known as El Greco (1451-1614). It is in his early work that the influence of icons is most evident, but it can be seen in his large-scale masterpieces produced in Spain later in his career. For more than two centuries Byzantine art was out of favor, primarily as a result of the Reformation, but in mid-nineteenth century France artists rediscovered Byzantine art and the Orient in general as can be seen in the work of Gustave Moreau and Jean Renoir. This influence spread throughout Europe and can be seen in the works of such diverse artists as Gustave Klimt (Austria, 1862 – 1918), and Theodore Ralli (Greece, 1852 – 1909). The influence grew into the twentieth century, particularly through the interest and work of Henri Matisse. The interest in Byzantine art has continued to grow and the field today includes scholars, best exemplified by the work of Hans Belting on the history of the Image, interested in a multitude of aspects of this classic tradition that had its roots in Rome and Egypt. 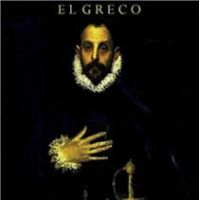 Born in Candia [now Herakleion], Crete, c. 1541; d Toledo, 7 April 1614, El Greco was a Greek painter, designer and engraver, active in Italy and Spain. He is considered the first great master of Spanish painting. Documentation on his early life is limited, but it is known that he was in Venice c. 1566 – 70 and may have studied in Titian's workshop. One of the most original and interesting painters of 16th-century Europe, he transformed the Byzantine style of his early paintings into another, wholly Western manner. He was active in his native Crete, in Venice and Rome, and, during the second half of his life, in Toledo. He was renowned in his lifetime for his originality and extravagance and provides one of the most curious examples of the oscillations of taste in the evaluation of a painter, and of the changes of interpretation to which an artist's work can be submitted. El Greco's Mannerist method of composition is nowhere more clearly expressed than in his masterpiece, The Burial of the Count de Orgaz (1586 – 88), where all of the action takes place in the frontal plane. From 1590 until his death his output was prodigious. His major commissions included the complete altar composition for the Hospital de la Caridad at Illescas (1603 – 05), for which he also worked as architect and sculptor. He excelled as a portraitist. His workshop produced many replicas of his works, but his style was so individual that his only followers were his son and a few forgotten imitators. This is a gentle story narrated by young Gabriel Harkin, the son of the title, who lives in Northern Ireland during the 1960s and 70s. A young boy in 1964 when the novel begins, his story is one of growing up during the time of the "troubles" which provide a subtle background for his personal experience of dealing with his own homosexuality. He does well enough in school, but is not a scholar, and from the beginning he does not fit in either at school or at home. The novel traces his gradual discovery of why this is, and his homosexuality is only one of the reasons. How he deals with his growing awareness of his sexuality is one source of suspense in the story. At the same time his family gradually prospers financially even as the violence of the "troubles" grows ever more menacing in the background. 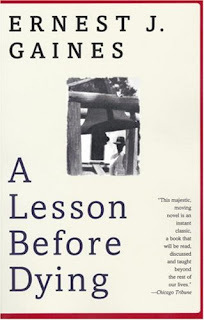 This novel is quiet and understated, but it has just the right tone for the story. There is additional suspense primarily due to a subplot regarding Gabriel's Uncle Brendan who is away from home at the beginning of the story. He returns and the result of that event along with the growing political clamor provides sufficient action to keep the reader interested until Gabriel's story comes to its climactic close. "in the world of knowledge the idea of good appears last of all"
Thing is true there is reality. But what of our nature as humans? And can we know the Good ourselves? 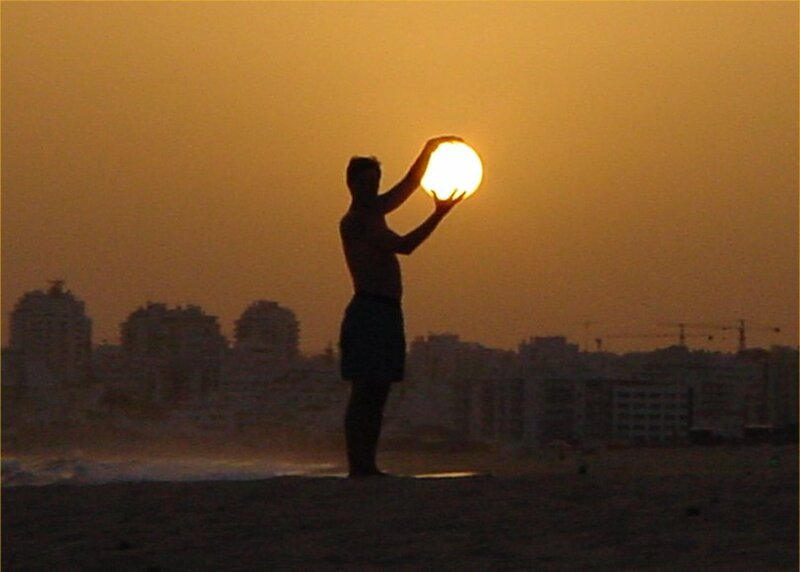 We may move closer to the Sun. The discussion of the good by Iris Murdoch reconsiders some of the themes found in Marcus Aurelius and Plato. This brought the philosophy exercises of the summer fitness class to a conclusion, but the exercise of philosophy did not end there for me. There will be further questions and meditation on these texts and others and on the ideas they consider, for philosophy, to me, consists of asking questions and searching and, perhaps, getting closer to the Sun. On the eve of her giving herself to Troilus Cressida is veiled upon her entrance (3.2.38). Reluctant in spite of the previous machinations of Pandarus she still requires further goading. Yet after the words of Troilus, "come, draw this curtain, and let's see your picture." (3.2.45) they kiss. The presumed shame, the mystery, the veil hiding the prize is pierced and it appears she and Troilus will be together. In the next act they meet and trade symbols of their feelings for each other. Cressida says, "O, you shall be exposed, my Lord, to dangers as infinite as immanent! But I'll be true." (4.4.65-70) Not a good sign, however he gives her a sleeve to wear as symbol of their love and she returns with a glove for her favored Troilus. The show is good, but the sincerity seems lacking as we see in the following act. Th'effect doth operate another way. Go, wind, to wind! There turn and change together. But edifies another with her deeds." Troilus and Cressida by William Shakespeare. The Arden Shakespeare, London. 1998. Carl Sandburg died on this day in 1967 in North Carolina, where he had spent his last years. At his request, his ashes were buried under the "Rembrance Rock" memorial that had been established the previous year in the backyard of his first home in Galesburg, Illinois. The concept of the memorial and its epitaph — "For it could be a place to come and remember..." — come from Sandburg's only novel, in which one of the characters, as a tribute to the nation's history, buries soil gathered from various historical sites in America beneath a large rock. I still have the multiple-volume set of Sandburg's Biography of Abraham Lincoln. One of the memories from my mother that reminds me of growing up with books in the house. 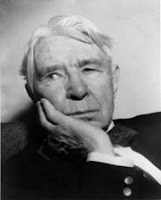 Both these memories and Sandburg's poetry will continue to remind me of his greatness. This is the first history in the modern sense (apologies to Herodotus who invented the genre). Thucydides, and Athenian general, wrote this history of the Peloponnesian Wars; admirable in its objectivity in discussing contemporary events, in its direct and descriptive style, and the author's grasp of cause and effect. It covers the history of the Hellenic race and ends, unfinished, in 411 B.C., seven years before the wars ended. The best-known passages are those relating Pericles' Funeral Oration, the plague at Athens, and the Sicilian expedition. The detailed reporting and acute political analysis vindicate Thucydides claim that the work is a "possession for all time." In fact, the parallels with modern international political history abound making this one classic relevant for our own day. This edition of the classic is particularly useful as edited by Robert B. Strassler, with a fine introduction by the classical scholar Victor Davis Hanson, and voluminous maps, notes, appendices; and a glossary and index. It uses the Crawley translation which some consider on a par with the more recent translation by David Greene. The Landmark Thucydides, Robert Strassler, ed. The Free Press, New York. 1996. We, however must escape to freedom. But this is only possible if we are indifferent to Fortune. Then we shall attain that one overriding blessing -- the serenity and exaltation of a firmly anchored mind. For when error is banished, we shall have the great and satisfying joy that comes from the discovery of truth, plus a kind disposition and cheerfulness of mind. - Seneca, On the Happy Life, IV. 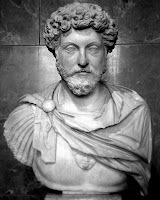 Marcus Aurelius emphasizes several themes in his notes on life known as the Meditations. Among them are the tenets that underlie the stoic philosophy that he learned from his teachers including a discussion of the importance of your duty both to your own nature and that of the whole universe. It is with these tenets in mind that we see him telling us to accept what is beyond our control (5.8) in his expression of the notion that freedom for man is possible only when he is indifferent to the his fate as decreed by nature. His view expresses this in the sense that the we are all a part of the whole of nature and recognition of that is necessary to achieve the good. The good which is always the moral good. It is acting like this, not in any morbid sense, but with a cheerfulness of mind, as described in the quote from Seneca above, that you will achieve the tranquility of being that is the ultimate form of happiness. James. P. Hogan died Monday at the age of 69. He was a science fiction writer in the grand tradition, combining informed and accurate speculation from the cutting edge of science and technology with suspenseful story-telling and living, breathing characters. Born in London in 1941, he worked as an aeronautical engineer specializing in electronics and digital systems, and for several major computer firms before turning to writing full-time in 1979. His first novel was greeted by Isaac Asimov with the rave, "Pure science fiction ... Arthur Clarke, move over!" and his subsequent work quickly consolidated his reputation as a major SF author. He wrote over a dozen novels including Paths to Otherwhere and Bug Park (both Baen), the "Giants" series (coming soon from Baen), the New York Times bestsellers The Proteus Operation and Endgame Enigma and the Prometheus Award Winner The Multiplex Man (all available from Baen). My own introduction to his work was Code of the Lifemaker (1983) where he fascinatingly tackled some really big questions about the nature of mankind. "If one cannot enjoy reading a book over and over again, there is no use reading it at all." On this day in 1919, the novelist and philosopher Iris Murdoch was born in Dublin. British writer, university lecturer and prolific and highly professional novelist, Iris Murdoch dealt with everyday ethical or moral issues, sometimes in the light of myths. As a writer, she was a perfectionist who did not allow editors to change her text. Murdoch produced 26 novels in 40 years. In 1948 she was elected a fellow of St. Anne's College, Oxford, where she worked as a tutor until 1963. Following that time, Murdoch devoted herself entirely to writing. Between the years 1963 and 1967 she also lectured at the Royal College of Art. 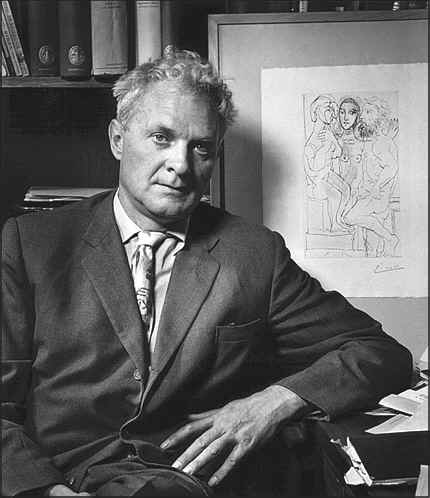 Murdoch's first published work, SARTRE, ROMANTIC RATIONALIST (1953), was a critical study. She had met Sartre in the 1940s, becoming interested in existentialism. Murdoch made her debut as a novelist with UNDER THE NET (1954), which had as its protagonist the Sartrean hero Jack Donaghue, but also suggested a familiarity with modern British philosophy. A SEVERED HEAD (1961) exploited Jungian theories of archetypes. A Severed Head analyzes Freud's theories about male sexuality and desire, and particularly the fear of castration. THE BELL (1958) is among Murdoch's most successful novels. It depcts an Anglican religious community in Gloucestershire. 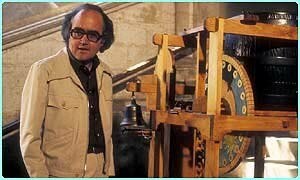 The events focus on the replacement bell to be hung in an abbey tower. Finally the difficulties of the task culminate in an effort to move the bell along a causeway to the gates of the nunnery - the bell suddenly falls into the water and sinks without a trace. The story was later televised. Often, Murdoch used fantasy and gothic elements, but her characters were realistically portrayed in their attempts to find meaning to their lives in extraordinary situations. In the 1950s, Murdoch wrote, "We live in a scientific and anti-metaphysical age, in which the dogmas, images, and precepts of religion have lost much of their power," and we have been left with "far too shallow and flimsy an idea of human personality." Many of her novels have a religious or philosophical theme, but she avoided clear political statements. "As I said, I do not think that the artist, qua artist, has a duty to society. A citizen has a duty to society, and a writer might sometimes feel he ought to write persuasive newspaper articles or pamphlets, but this would be a different activity. The artist's duty is to art, to truth-telling in his own medium, the writer's duty is to produce the best literary work of which he is capable, and he must find out how this can be done." (from Existentialists and Mystics, Peter Conradi, Ed., 1997) In THE TIME OF THE ANGELS (1965) the protagonist is Carel Fisher, an eccentric Anglican priest in an inner-city parish, who engages in devil worship. His daughter Muriel finds out that his niece Elizabeth is his illegitimate daughter, and lets him die following an overdose of sleeping pills. "Those with whom the angels communicate are lost," says one of the characters. In the experimental novel THE BLACK PRINCE (1973) the narrator is a self-conscious writer, Bradley Pearson. He is obsessed by perfection and sees the artistic calling as "a doom," a Last Judgment. A passionate love awakens his Black Eros, a source of love and art, and he lands in jail for a crime he did not commit. "Can there be a natural, as it were Shakespearean, felicity in the moral life?" he asks. THE GOOD APPRENTICE (1985) was an allegory of the battle between good and evil, focusing on the protagonist's suffering. Stuart Cuno has decided to become good, and his methods include celibacy, chastity and the abandonment of a promising academic career. Stuart's stepbrother Edward Baltram is tormented by guilt because he has, he believes, killed his best friend. Stuart goes to rescue Edward from his 'journey to the underworld' and causes a final catastrophic clash of forces. Murdoch's major work is considered THE SEA, THE SEA, which won the Booker Prize in 1978. The narrator, Charles Arrowby, is a tyrannical director-playwright who, after 40 years, again makes contact with his worn-out childhood sweetheart, bullies her without being able to change, and then starts an affair with an equally monstrous 18-year-old girl. My personal favorite of her novels is A Fairly Honourable Defeat (1970), in part because it was my introduction to her writing. In recent years The Black Prince, due to its' themes and style has also become a favorite of mine. She died in Oxford on February 8, 1999. In his memoir Elegy for Iris John Bayley portrays his brilliant wife lovingly but unsentimentally. "She was a superior being, and I knew that superior beings just did not have the kind of mind that I had." Murdoch's benevolent personality was not broken by her disease. In Iris and Her Friends: A Memoir of Memory and Desire (1999) Bayley continued his examination of his long romance. Richard Eyre's film Iris (2001), starring Judi Dench, Jim Broadbent, and Kate Winslet, was based on Bayley's Elegy fo Iris. Early this morning I was reading the play Troilus and Cressida by Shakespeare. The story is based on characters from Homer's Iliad although the love story of Troilus and Cressida is not in the Iliad. Rather, it is a medieval tale that is not part of Greek mythology; Shakespeare drew on a number of sources for this plot line, in particular Chaucer's version of the tale, Troilus and Criseyde. While I was reading this the idea of connections came to mind. In this case the connection is between Shakespeare and the medieval story and Homer; but this suggested to me a book I read some time ago about connections in the history of ideas. This book is Connections by James Burke in which he examined the ideas, inventions, and coincidences that have culminated in the major technological advances of today. With dazzling insight, he untangled the pattern of interconnecting events: the accidents of time, circumstance, and place that gave rise to the major inventions of the world. Burke stated, "My purpose is to acquaint the reader with some of the forces that have caused change in the past, looking in particular at eight innovations -- the computer, the production line, telecommunications, the airplane, the atomic bomb, plastics, the guided rocket, and television -- which may be most influential in structuring our own futures....Each one of these is part of a family of similar devices, and is the result of a sequence of closely connected events extending from the ancient world until the present day. Each has enormous potential for humankind's benefit -- or destruction." These connections continue to occur , whether in science and industry or in the humanities as I found in reading Shakespeare. I find connections fascinating and the stuff that serves as catalyst of my own curiosity. I wonder. Connections by James Burke. Simon & Schuster, New York. 1980. Gustav Mahler (7 July 1860 – 18 May 1911) was a late-Romantic Austrian composer and one of the leading conductors of his generation. As a composer, he acted as a bridge between the 19th century Austro-German tradition and the modernism of the early 20th century. While in his lifetime his status as a conductor was established beyond question, his own music gained wide popularity only after periods of relative neglect which included a ban on its performance in much of Europe during the Nazi era. After 1945 the music was discovered and championed by a new generation of listeners; Mahler then became one of the most frequently performed and recorded of all composers. There was a particular resurgence of performance of his music in the 1960s which his when I was introduced to his symphonies. His passion for music, his personal focus both on death and the meaning of life resonated with audiences then and to this day. Born in humble circumstances in rural Bohemia, Mahler showed his musical gifts at an early age. After graduating from the Vienna Conservatory in 1878, he held a succession of conducting posts of rising importance in the opera houses of Europe, culminating in his appointment in 1897 as director of the Vienna Court Opera (Hofoper). 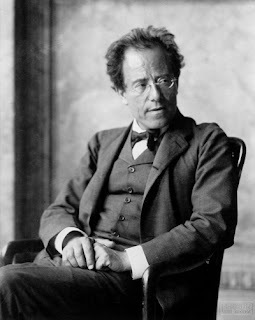 During his ten years in Vienna, Mahler—who had converted to Catholicism from Judaism to secure the post—experienced regular opposition and hostility from the anti-Semitic press. Nevertheless, his innovative productions and insistence on the highest performance standards ensured his reputation as one of the greatest of opera conductors, particularly as an interpreter of the stage works of Wagner and Mozart. Late in his life he was briefly director of New York's Metropolitan Opera and the New York Philharmonic. Mahler's œuvre is relatively small—for much of his life composing was a part-time activity, secondary to conducting—and is confined to the genres of symphony and song, except for one piano quartet. He would regularly spend summers in the country outside Vienna composing and the sounds of nature along with fold songs often shine through his work. Most of his ten symphonies are very large-scale works, several of which employ soloists and choirs in addition to augmented orchestral forces. These works were often controversial when first performed, and were slow to receive critical and popular approval; an exception was the triumphant premiere of his Eighth Symphony in 1910. Mahler's immediate musical successors were the composers of the Second Viennese School, notably Arnold Schoenberg, Alban Berg and Anton Webern. Shostakovich and Benjamin Britten are among later 20th-century composers who admired and were influenced by Mahler. The International Gustav Mahler Institute was established in 1955, to honour the composer's life and work. The annual county fair was always an event at the end of each Summer that I looked forward to when I was a young boy growing up in a small Wisconsin town. It was fun and something in which our whole family participated. In contrast to my personal experience, Something Wicked This Way Comes is the story of two 13-year-old boys, Jim Nightshade and William Halloway, who have a harrowing experience with a nightmarish traveling carnival that comes to their Midwestern town one October. The carnival's leader is the mysterious "Mr. Dark" who bears a tattoo for each person who, lured by the offer to live out his secret fantasies, has become bound in service to the carnival. Mr. Dark's malevolent presence is countered by that of Will's father, Charles Halloway, who harbors his own secret desire to regain his youth. The novel combines elements of fantasy and horror, analyzing the conflicting natures of good and evil, and on how they come into play between the characters and the carnival. Unlike many of Bradbury's other works, including the tangentially related Dandelion Wine, which is a collection of loosely related short stories, Something Wicked This Way Comes is a full-length novel. The novel may be interpreted as an autumn sequel to the summer of Bradbury's Dandelion Wine. 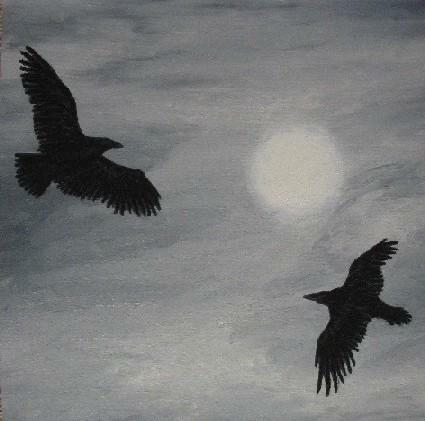 The two works are set in the fictitious Green Town (based on Bradbury's hometown, Waukegan, Illinois), but have different tones, with Something Wicked emphasizing the more serious side of the transition from childhood to adulthood. While none of the characters in Dandelion Wine make an appearance in Something Wicked, William Halloway and Jim Nightshade can be viewed as one-year older representations of Dandelion Wine's Douglas Spaulding and John Huff, respectively. I will never forget my first reading of this book almost forty years ago. Bradbury's work is the quintessential small-town-meets-the-fantastic style novel that so many talespinners have emulated since. ~Emily Dickinson, "Time and Eternity"
The "corridors" of our brains are many and discoveries while roaming them are the stuff of memories, ghost-like or not. The artist American artist Jenny Holzer was commissioned to present a series of poems to mark Samuel Beckett's centenary, as a part of of the Beckett Centenary Festival at the Barbican. Each night for 8 days she projected a number of poems against London landmarks, such as City Hall, Somerset House on the Strand and the Barbican. 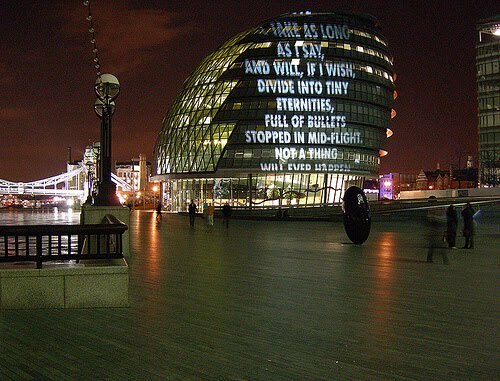 Writings from Beckett and a selection of works by celebrated poets, were cast as light projections onto well-known London landmarks, allowing light and text to flow over the cityscape, creating an extraordinary visual experience. This series of light projections is part of a programme by Jenny Holzer called ‘For the City’, which took other cities too, such as New York (to be published on Inspiring Cities later). In London, she projected poems by several poets. The Poem Projected in the above picture was written by the 1996 Nobel Prize winning Polish poet Wislawa Szymborska. Printed in bold is the text in the picture. A hero is someone who does something for other people. He does something that other men don't and can't do. He is different from other men. He is above other men. No matter who those other men are, the hero, no matter who he is, is above them. "Do you know what a myth is, Jefferson?" I asked him. "A myth is an old lie that people believe in. White people believe that they're better then anyone else on earth -and that's a myth. The last thing they ever want is to see a black man stand, and think, and show that common humanity that is in us all. It would destroy their myth. They would no longer gave justification for having made us slaves and keeping us in the condition we are in. As long as none of stand, they're safe. Please listen to me, because I would not lie to you now. I speak from my heart. You have the chance of being bigger then anyone who has ever lived on that plantation or come from this little town. You can do it if you try. You have seen how Mr. Farrell makes a slingshot handle. He starts with just a little piece of rough wood- any little piece of scrap wood- then he starts cutting. Cutting and cutting and cutting, then shaving. Shaves it down clean and smooth till it's not what it was before, but something new and pretty. You know what I'm talking about, because you have seen him do it. You had one that he made from a piece of scrap wood. Yes, yes - I saw you with it. And it came from a piece of old wood that he found in the yard somewhere. And that's all we are Jefferson, all of us on this earth, a piece of drifting wood. until we - each of us, individually- decide to become something else. I am still that piece of drifting wood, and those out there are no better. But you can be better. I often read award-winning books with the expectation that the award means that they will be better than the average book. 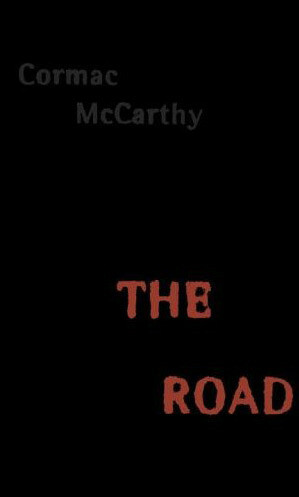 Seldom am I so moved by the writing and content of a book as I was in reading The Road by Cormac McCarthy. I had read his Border Trilogy and particularly enjoyed All the Pretty Horses, the first novel of the trilogy. That was what I will call McCarthy lite. The Road, published in 2006 is a much more serious novel. It is a post-apocalyptic tale of a journey taken by a father and his young son over a period of several months, across a landscape blasted by an unnamed cataclysm that destroyed all civilization and, apparently, almost all life on earth. 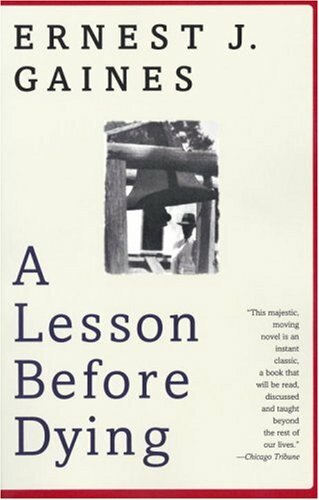 The novel was awarded the 2007 Pulitzer Prize for Fiction and the James Tait Black Memorial Prize for Fiction in 2006. The story tells of an unnamed father and his son journeying together, some years after a great, unexplained cataclysm has destroyed civilization and almost all life on Earth. Realizing that they will not survive another winter in their current location, the father leads the boy south, through a desolate American landscape along a vacant highway, towards the sea, sustained only by the vague hope of finding warmth and more "good people" like them, and carrying with them only what is on their backs and what will fit into a damaged supermarket cart. The bleakness of the setting is mirrored by a bleak, terse quality to McCarthy's prose. The details of their world, provided in small bits of narrative build to make a horrifying picture of desolation. Seldom have I read of a dystopia so bleak and foreboding. Nearly all of the few human survivors are cannibalistic tribalists or nomads, scavenging the detritus of city and country alike for human flesh, though that too is almost entirely depleted. Overwhelmed by this desperate and apparently hopeless situation, the boy's mother, pregnant with him at the time of the cataclysm, commits suicide some time before the story begins; the rationality and calmness of her act being her last "great gift" to the man and the boy. It is clear that the father is dying, yet he struggles to protect his son from the constant threats of attack, exposure, and starvation, as well as from what he sees as the boy's innocently well-meaning, but dangerous desire to help wanderers they meet. Through much of the story, the pistol they carry, meant for protection or suicide if necessary, has only one round. The boy has been told to use it on himself if capture is imminent, to spare himself the horror of death at the hands of the cannibals. In the face of these obstacles, the man and the boy have only each other (they are "each the other's world entire"). The man maintains the pretense, and the boy holds on to the real faith, that there is a core of ethics left somewhere in humanity. They repeatedly assure one another that they are "the good guys," who are "carrying the fire." A question that I had and which grew as I read more of the narrative was: what is the meaning of good in the world they inhabited? It was good when they found some meat or when they made it to another day - simple existence takes on new meaning in this context. The humanity of the son is kept in check by his father for fear of the danger that seemed to exist everywhere. The horror is both devastating and haunting. It arises from the discovery of death while they gradual decline in their ability to continue. The darkness of their journey is lightened somewhat by the ending and that, without discussing specifics, seems to me to be an important suggestion that their may be some hope for the next generation - the boy's future seems to hold some promise even in the face of the bleak territory that he traversed with his father. In its way the book is at first unsettling, but if you continue to meditate on the events and relationships therein it becomes challenging and thought-provoking. The result of those thoughts may take some time to decipher. More than one hundred years ago at the end of the century prior to the last a fifty-one year old man set sail for a trip around the world. 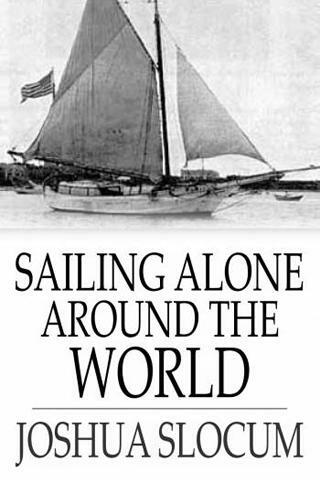 Joshua Slocum capped his sea-going career with this trip in a sail boat, named The Spray, that he built himself and, upon his return, he memorialized his trip by writing the narrative of his trip, Sailing Alone around the World. His career had waned with the gradual demise of large sail-going ships and he put all of his years of experience on them, plus some help from friends and strangers along the way, into this voyage. The story he told about it still has power to grip the reader's imagination yet today. Many incidents are shared as he travels from place to place and is in and out of danger on several occasions, mostly due to the vagaries of mother nature. Some of those incidents were survived mainly through his own good luck in combination with his sailing experience, for it is clear that nature is more powerful than any sailing vessel, surely one so small as his single manned craft. Early on in his voyage he is chased by pirates, but eludes them and goes on to enjoy the hospitality of the British at Gibraltar. Their would be more hospitality that he would experience during his long three year trip and there would be a deadly encounter with a native, but no more pirates. I was impressed with his devotion to reading which he kept up both with books that he took with him and books that he obtained along the way. This was undoubtedly a life-long habit and it must have been helpful as he sat down to narrate his travels upon his return. I also marveled at the ebb and flow of time as the journey seemed to go more swiftly than one would expect a span of three years to unfold. There was one theme that grew over the course of the story, Joshua was not alone after all. His sailing ship, The Spray, had become much more than a mere container bobbing on the waves. No, it had become his close companion whose heart and soul was one with Joshua - a wonderful occurrence that only seafarers and readers could appreciate. At the conclusion of the book I had admiration for this humble man who took on a challenge that would defeat most men much younger than his fifty-one years and who succeeded.